Too often when one generation passes on, the family stories and histories are lost to the ages. In times past, we learned about our ancestors and relatives through stories told at the dinner table or at family gatherings. Some of it true. Some of it, almost true! Genealogy websites and DNA testing have put more of the pieces to the puzzle together. This website has been created as a repository of information for both the Sisco and Youngs families along with extended families. It is a labor of love for our children and our children's children. It is a place to reminisce about loved ones, share and see photos of ancestors and to perhaps learn things about our families that we never knew. Thank You Bonnie Sisco for your assistance in uploading family photos. If any family members would like to add photos of their families, it's easy. Simply email the administrator for instructions. The hope is that you will spend time recording and reminiscing about people and times past. Horst is related to the Edingers and lives in the village of Glanbrücken (formerly two separate villages Niedereisenbach and Hachenbach). 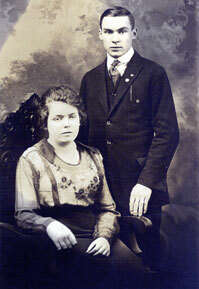 The Edingers lived and emigrated from Niedereisenbach, Germany. Horst has been very helpful in sharing insights into this branch of our family. Just added - Johann Georg Edinger Information from Horst Mueller.